Airbnb is an online marketplace for people to lease or rent short-term lodging, and to create or book local experiences. It has disrupted the hospitality industry and convinced millions of people to do something that was previously unthinkable: sleeping in a stranger’s home. 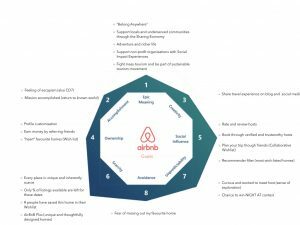 Airbnb is one of key players in the “platform revolution”: A revolution of fast-growing tech companies whose success depends on the careful orchestration of high-value interactions among users. Airbnb prides itself on embracing a user-centred approach to design and innovation. As the co-founders put it, the company “bleeds design”. According to them, the number one secret for its success has been their ability to tackle the stranger = danger bias. Most people are risk averse and sleeping at a stranger’s home activates our inner fears of the “unknown other”. In other words, they have identified the key Anti-Core Drive that all sharing economy companies face – lack of trust – broken it down in its components, and designed for it. But what sets Airbnb apart from competitors providing similar products, features and services? Gamification! 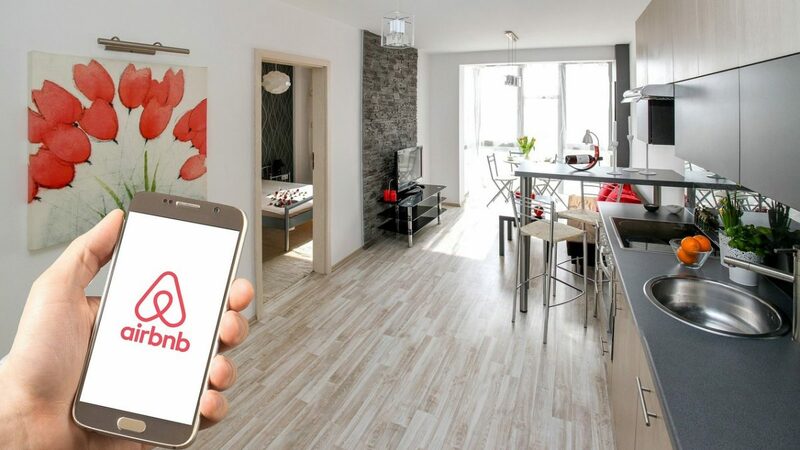 You may be thinking.. Airbnb doesn’t really look like a game. Correct! Not all engaging experiences look and feel like games. If that’s the case, we call it “explicit” gamification. But Gamification can also be more subtle, what we call “implicit” gamification. One example is the Linkedin progress bar to encourage users to complete their profile. And an experience is not either completely “explicitly” “Implicitly” gamified. Think of it as a spectrum, with some elements more game-like than others. Ok, now let’s wear the Octalysis lenses, and find out what makes Airbnb so engaging! New to the Octalysis Gamification? Read the Octalysis fundamental principles here. Most of the motivation design techniques adopted by Airbnb are not very visible to the users. 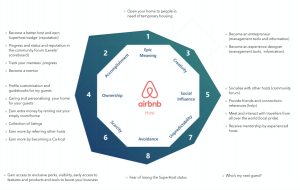 For example, it has created a strong brand by leveraging on Core Drive 6: Scarcity & Impatience (“book unique homes”) and Core Drive 5: Social Influence & Relatedness (“experience a city like a local”). This is in sharp contrast with other brands. Wimdu (Figure 1), for example, invokes Core Drive 2: Development & Accomplishment by focusing on getting great deals. Airbnb also attempted to engage travelers through Core Drive 1: Epic meaning & Calling– the higher purpose behind our actions that make us feel good, and in control. First, in The Airbnb Story (2017) Leigh Gallagher explains how the company searched for its soul and moved away from a focus on utility (saving money) to the current slogan “Belong anywhere”. Second, it has identified a clear “enemy” to defeat: mass tourism. Travelers choose Airbnb because they feel part of the sharing economy movement, and believe tourism should benefit locals. Third, Airbnb is a good example of how understanding the Core Drives of human motivation can also reveal new entire products. At the launch of Trips (which allows hosts to craft local experiences to travelers) Airbnb’s CEO talked about what’s behind the new product: the “Hero Journey”, a “story” of one main character going through a transformational journey. Finally, it has launched the Social Impact Experiences (guided tours and experiences by nonprofit organisations that receive 100 percent of what travellers pay) and the Open Homes Program, which allows hosts to open their doors to refugees and displaced people (Figure 2). Core Drive 5: Social Influence & Relatedness tells us that we make decisions based on what other people do, think or say (plus other more specific aspects related to a sense of relatedness). How has Airbnb applied Core Drive 5? It has attempted to turn travel planning into a social experience through a Collaborative Wishlist feature. It also carefully applies Core Drive 2: Development & Accomplishment in the search experience. This is achieved in combination with an infinite scroll UX/UI. Leveraging Core Drive 7: Unpredictability & Curiosity, the user is engaged in an exciting search of the most popular and unique homes. In The Airbnb Story, Gallagher (2017) notes how the breadth and whimsy of the options offered makes scrolling through Airbnb’s listings an exercise in escapism. Airbnb’s growth story also tells us why focusing on details is so important in engagement design: When the design team managing the Wishlist feature decided to change the generic star to a heart, engagement increased by 30%. This is because the star is utilitarian (functional), while the heart is aspirational. Core Drive 4: Ownership & Possession tell us that when we love something (or someone), our perceived value increases. Moreover, the heart has given travelers a reason to visit and engage with the site not only when looking for an accommodation, but also when they are bored or feel like day-dreaming. What about scarcity design? We already noted that strategic communication (“unique” and “authentic” accommodations) creates a sense of scarcity. But availability is also signalled through other more explicit elements (see Figure 4). Core Drive 7: Unpredictability & Curiosity is embedded into the company DNA. Oliver Schlake notes “[…] the company figured out a way in 2008 to engage people in a storyline that starts online and then crosses to the real world (when a stranger shows up on your doorstep, suitcase in tow) […]. Something similar happens in video games, when players open a portal or enter a cave to see what happens next” (Robert H. Smith School of Business). Core Drive 7 is also often used through conventional push marketing campaigns such as the “Night At” contest, which allows lucky guests to stay for only one night in unique accommodations. 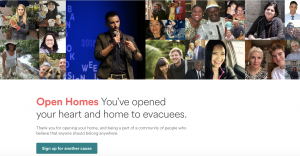 How does Airbnb engage its hosts and encourage them to improve their offerings? It is strongly focused on CD4: Ownership & Possession (earn money by renting out your space and become a co-host to manage other people’s properties and earn more) (fig. 6) and CD2: Development & Accomplishment (become more experienced). Remember: when an experience is more game-like, we call it “explicit” gamification. Airbnb has chosen this approach to engage its hosts, through a Superhost program: when certain conditions are met, they can earn a badge (an example of an achievement symbol) which gives them higher status within the Airbnb community, and exclusive rewards (CD6). These include perks (such as extra bonuses when referring friends, and discounts on Airbnb experiences), access (to events and new products), increased visibility (Superhost filter for guests), and boosters (tools to boost their business). They clearly use the SAPS reward model (Status, Access, Power, Stuff) developed by Gamification designer Gabe Zichermann. At the Octalysis Group in additions to SAPS rewards, we look at the Six Contextual Types of Rewards, which help to bring Gamification to the next level. To learn more about it check this article. 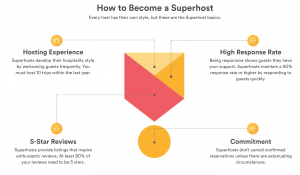 The Superhost program aims to create incentives to guarantee an optimal level of engagement, to turn hosts into guests, and guarantee the quality of the service offered. To sustain the desired behaviour, they leverage CD8: Loss & Avoidance. They can in fact lose the status if the requirements are no longer met. A recent study (Liang et al., 2017) recently confirmed the positive impact of achieving the Superhost badge in terms of income earned and number of reviews received from guests. Finally, we can see CD5: Social Influence & Relatedness in action, with a Mentor Program, that allows hosts to earn money by supporting others. This expansion of opportunities can be seen as end-game design and reflects the true power of human-focused design to shape platform strategies. … but could it be more engaging? By looking at the above Octalysis analysis it definitely can, especially for its guests. Indeed, a Superguest Program is likely on the way. Airbnb has created engagement over time with a lot of trial and error. However, this method is time-costly and likely to leave gaps in user motivation, thus resulting in limited or short-lasting engagement. With the right expertise, product designers can embed gamification (or what we call “human-focused design”) into the product DNA from early stages. Massimo Ingegno, Senior Gamification Consultant, The Octalysis Group. 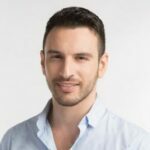 Massimo is a Senior Gamification Consultant and Instructor. He’s based in Bangkok, where in addition to help companies and organizations create engaging experiences, co-directs the Design, Business and Technology Management (DBTM) international program at Thammasat University, a leading university in Thailand. Wow, never thought about AirBnb this way. Thanks a lot for that post! Interesting perspective. looking forward for more!